. I'd be content to average 24mph solo/time trial on a standard road bike for 20 miles. That would be in great shape for me, but I need a power meter which is going to cost as much as my whole bike apparently...but it's really the only way to improve riding ability. Tens of thousands of people went way faster than 24 mph before power meters were invented. Thousands more still do so without a powermeter. Even the most expensive power meter in the world isn't going to help you go from 12 mph to 24, though. No kidding. I'm always amused by the misconception that to improve beyond a certain point, you absolutely need power data. You know how many slow people have power meters? Plenty. There are still a handful of pros who do not train with power at all, and there were many generations who managed to become blazing fast just fine before the advent of power data in the 90s. not the only way of course but how else would you know you are improving without any concrete data when you are riding on your own? Just seems like the best data tool out there. I don't think many average 24mph over a considerable distance because we know tour riders can ride at 25-29 on flats but they are in a group taking turns pulling the group. I just want to do around 24mph on flats for 20 miles solo on a standard road bike. 19mph is already 200 watts which is what I can maintain on flats solo on my road bike. Just to get to 23-24mph you need to jump another 100 watts. Most are not comfortable staying in the 300-400 watt range. How would I get comfortable at 300 watts if I don't know when I'm doing 300 watts without a power meter? Last edited by MyTi; 07-19-18 at 11:30 AM. Thomas won in about 3 and a half hours, for an average speed of 19mph. Right on... thanks for the correction. The Alpe d'Huez finish today is 13.8 km at an average grade of 8% and apparently is done in 40-45 minutes by many of the TdF competitors, which is up to 12.8 mph. It is the most accurate tool out there for quantifying exactly how much force you can put through the pedals for a period of time. Doesn't mean you can't see improvements through other means, like perceived exertion, HR, timing yourself over a given loop, Strava, etc etc. Back before power meters and heart rate monitors, riders used time and distance. At the velodrome it was easy to do. On the road, riders would have a short course they rode with no stops and time themselves over it. Also, indoor trainers/ ergometers allowed for repeatable consistent testing. Last edited by colnago62; 07-19-18 at 12:01 PM. You're overthinking it. If your goal is to ride 20 miles at an average speed of 24 mph, you only need to know your speed, not your power.. You'd do over/under interval training where you hold higher than 24 for increasing periods of time followed by recovery until you're able to hold 24 for about 50 minutes, which would get you to 20 miles. Watts are irrelevant if your goal is a specific speed number. If your goal is to hold 300 watts for 20 miles, then yea, you'll need a power meter, but it sounds like that isn't your goal. The best data for going fast is speed. Again, how do you think people went fast before powermeters? Many, as in the general population? No. Many, as in people that train and race? Yes. Absolutely. Why are you even bothered about watts without having a powermeter? You have no idea what 300 watts is, so why are you worried about being comfortable at it? And news flash: You're not going to get comfortable at 300 watts. I've done 300 watts for 3 hours before. At no point was it what I'd consider "comfortable". It's never about getting comfortable. It's about getting capable, which you can 100% do without a powermeter. If you're purely worried about speed, you should go to slowtwitch.com and revel in the "last race how fast on how many watts?" thread. There's so much more to going fast then just putting the power to the pedals. Discussions change in interesting ways as you get towards more aero-optimized configurations. The difference between road bikes and performance-oriented recumbents is that riders of the former brag about how many watts they deliver, while riders of the latter brag about how few watts they need to deliver to accomplish something. Well let's say the goal is 24mph for a 20 mile stretch. With a power meter I can take the bike out on flat lands on a day when it's not windy and find out how many watts it takes to maintain 24mph on my bike. If I am simply relying on speed, there are too many variables in play, such as headwind. If I'm in a headwind it will obviously take more watts to maintain 24mph. So a power meter helps you to train a lot smarter in that regard from what I see, holding 300 watts in a headwind, rather than blowing yourself up trying to maintain 24mph in a headwind makes more sense. For a distance rider being able to maintain constant power, rather than constant speed also makes more sense. I do wish there was a way to get real time power readings, without having to buy a power meter of course. Is there anything that will give me a ball park power reading real time during the ride, without getting a power meter? I have no desire to shell out 1k on a crankset with a power meter. I really don't like the 1 year warranty on something that costs $1k either. The P1 pedals, stages all only have a 1 year warranty. Seems a bit ridiculous to offer a 1 year warranty on such an expensive product. I would think offering at least a 3 year warranty is reasonable. In the end it's the bad warranty on these devices that has me questioning on whether to get one or not. I do wish there was a way to get real time power readings, without having to buy a power meter of course. Is there anything that will give me a ball park power reading real time during the ride, without getting a power meter? I have no desire to shell out 1k on a crankset with a power meter. There are some attempts at power estimators that use airflow readings ("power pod"), but they aren't super accurate and are still fairly expensive. If this is something you're really curious about, your best bet is to find an older PowerTap rear wheel. There are plenty on eBay for under $200. For the rest of your post... you can reasonably train for something like a goal of 24mph average over 20 miles with just speed and HR. If you know that on a windless flat road, you can hold 24 mph at around 170 bpm, then 170 bpm into a headwind/uphill (even if it's 15 mph) is still going to be approximately the same effort. Caveat is that HR can fluctuate day to day based on all kinds of variables, but the more you train with HR the more you are able to get a "feel" for a particular level of effort. Point is... a PM is a very useful training tool but it's not necessary to get faster or achieve a specific goal. Last edited by Dan333SP; 07-19-18 at 04:00 PM. If I am simply relying on speed, there are too many variables in play, such as headwind. Nobody is telling you to train by holding constant speed. All they said was that a speedometer is the best way to know to know how fast you're going. As far as training, the point is that the usefulness of data has diminishing returns. It's possible to build a training plan around cheaper metrics like heart rate, or even seriously wishy-washy crap like "perceived effort", and still see results. The main reason that ownership of a power meter is well-correlated with rider performance isn't that power meters make you massively stronger, it's that the strong riders who follow actual training plans are the people who buy power meters. Last edited by HTupolev; 07-19-18 at 04:13 PM. Wow, that is incredibly fast! I do wish there was a way to get real time power readings, without having to buy a power meter of course. Is there anything that will give me a ball park power reading real time during the ride, without getting a power meter? Absolutely! RPE works very well for training. Once you've ridden a few 20 min intervals at threshold you learn what your legs feel like - that uncomfortable, burning sensation that indicates you're riding on, or close to, the edge. A power meter is nice but it won't do the hard work for you. Find a hill and time yourself on a section once in a while to give yourself an idea of how you're progressing. I started riding again in May after 8 years away. I started at 6' and 257lbs. lucky to break 10mph avg. 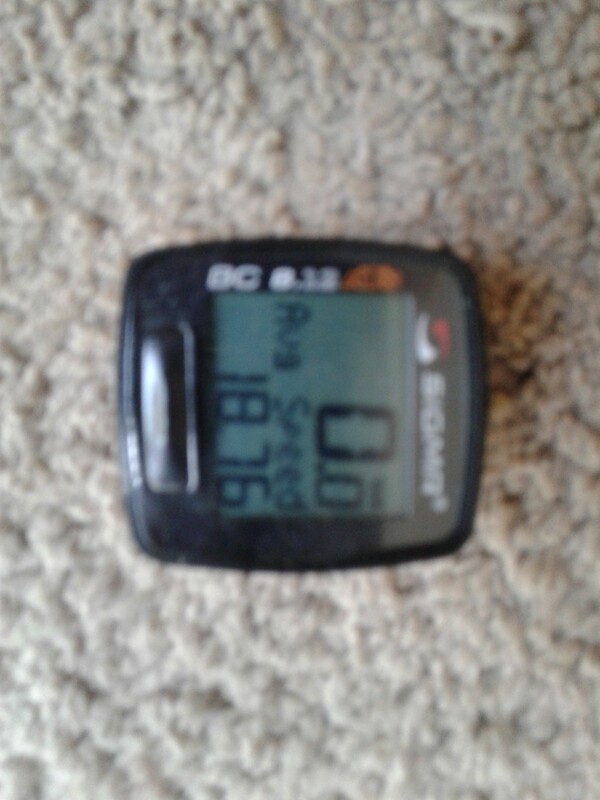 I am now down to 227 and riding 20 to 25 miles atleast 4 days a week and just at 12.5 avg mph. Still hoping to see that 16 to 18 mph avg again. Update: I started doing core work 2 weeks ago just 15 minutes a day. Also started checking my cadence and realized I was way low. Ive got my cadence up to 80 to 85 and between the core work and the cadence increase I gained 2mph on my average. ...How would I get comfortable at 300 watts if I don't know when I'm doing 300 watts without a power meter? Find a steep hill that's long enough to take a decent amount of time and is a steady grade, put accurate weights in Strava and see what it says. At slow enough speeds the wind resistance is not much of a factor and Strava will be close enough to know what 300 watts feels like. It will also track your improvement over time. The drawback is that 300 watts uphill does not feel exactly like 300 watts flat, but as far as perceived effort, legs lungs and heart, I'll bet you could generalize the perceived effort. The winner of the TdF's 20th stage today (by less than a second over **** ******), time trial specialist *** ********, apparently according to a commentator was doing 12-something mph in an aero-position on the 10.2% climb that's just 3km before the finish of the 31km ITT. The winner of the TdF's 20th stage. The main reason that ownership of a power meter is well-correlated with rider performance isn't that power meters make you massively stronger, it's that the strong riders who follow actual training plans are the people who buy power meters. This post may be a few days old, but it's definitely worth repeating - here and elsewhere. Sure, there are those who just like to throw money at their interests, but for the most part, you have to want to be stronger and faster if you're going to spend the dosh on a power meter, and it's the wanting it that actually gets you there. So my son is 8 and his average speed is about 11.5, to put that into perspective. I think your poll should have a break-point at 80 miles per week, and s breakpoint at 16 mph average. But just remember that people who have a lot of hills, that also need to brake going back down hills (city, red lights, etc) May skew the numbers. If you could do 12 on a long 10% climb, this whole question wouldn't apply. But even at that speed, Strava estimates wouldn't be that bad, because of the sheer amount of power needed to lift your weight that quickly for that distance, which is very easy to figure out. Sounds right but for anyone with a training/goal-oriented workout plan that does not employ a power meter, it seems to me that at least on a personal level, given the same course and a large enough number of rides... looking at avg. mph seems like the best metric because it is the direct result of the only variables you can control to increase performance-- gear selection and RPMs over a given time or distance. But, it has its shortcomings over being able to track the watts in that weather, wind and mood changes everything. My ride this morning. Good weather, rolling hills, 6-8mph winds in my face half the time, tailwind the other half.. Solo, I'm 50 years old. If I didn't have to make any traffic stops I obviously would have averaged higher. I ride almost everyday, average distance is probably 25-35 miles. Don't know why the pics are sideways. I dd 29.9mi with 18.76avg.